Corruption is a blot on the Indian Democatic system which has tranished the image of India in global domain since ages. Corruption has been defined variously by scholars. But the simple meaning of corruption is undue favour for any one for some monetary or other gains. Every time one pays extra money to acquire a service or an object our economy suffers a loss but people don't understand that their small act of bribery has devastating imapct on country's economy and it's machinery. 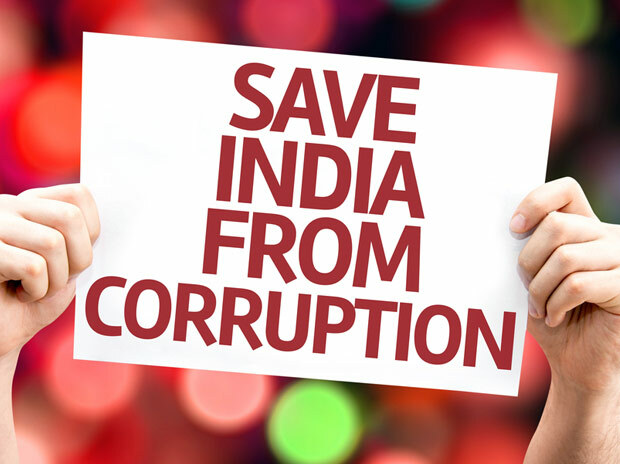 As per the recently published Corruption Perception Index 2015 by Berlin-based corruption watchdog Transparency International (TI), India has been ranked 76th out of 168 countries.The country’s 2015 corruption perception score remains as 2014 edition – 38/100 – showing lack of improvement. However India has improved in its ranking compared to earlier position of 85 and 94 in 2014 and 2013, respectively. The Corruption Perception Index 2015 evaluates 168 countries across the world on a scale of 0 (highly corrupt) to 100 (very clean) according to which higher the score points on a scale of 0-100, lower is the corruption in that country. Top-scoring countries : The top-scoring countries are Netherlands (87), New Zealand (88), Sweden (89), Finland (90) and Denmark (91). Countries at the bottom of CPI : Angola (rank 163), South Sudan (rank 163), Sudan (rank 165), Afghanistan (rank 166), North Korea (rank 167) and Somalia (rank 167). BRICS Countries : South Africa (rank 61), India (76), Brazil (rank 76), China (rank 83) and Russia (rank 119). It should be noted that the “clean” countries such as Denmark Finland, Sweden, Norway and Netherlands which are being hailed as the model economic states are bein criticised for their foreign policies which are contradictory to their corruption-free home affairs for instance Swedish-Finnish firm TeliaSonera whose 37 per cent shares are owned by the Swedish state is facing allegations that it paid millions of dollars in bribes to secure business in Uzbekistan, which comes in at 153rd in the index. The company is now pulling out of business in Central Asia. As per the economic surveys around 1 trillion dollars are wasted through corruption every year while the poor popultaion struggles everyday for basic need of life.That money can be used to eradicate poverty from the world. In a country where corruption is at peak everything that can be bought or sold becomes a means to exploit the poor and the impacts of corruption are far beyond it as they promote inhuman practices such as child labour, human trafficking, child mortality, illiteracy, environmental hazards and most importantly terrorism. As per the reports of Transparency International in year 2005, nearly 62% of Indians had first hand experience of paying bribes or influence peddling to get jobs done in public offices successfully. The largest sources of corruption in India are entitlement programmes and social spending schemes run by the Indian government for example -Mahatma Gandhi National Rural Employment Guarantee Act and National Rural Health Mission. Which one of these neighbors of India recognizes Kosovo as an independent nation?